Television presenter Angie Hilton and clinical psychologist Chris Mackey discuss how to find your character strengths signature as well as some practical ways to apply the results. 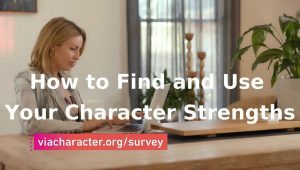 The character strengths survey can be found at http://www.viacharacter.org/www/Character-Strengths-Survey. This clip was taken from series 2, episode 9 of Australian Television show, Destination Happiness.